Traditionally, samosas are a fried Indian snack food, but I like to eat and easy baked vegetarian samosas as an entree, or along with some other vegetarian Indian food sides, such as rice and dal. 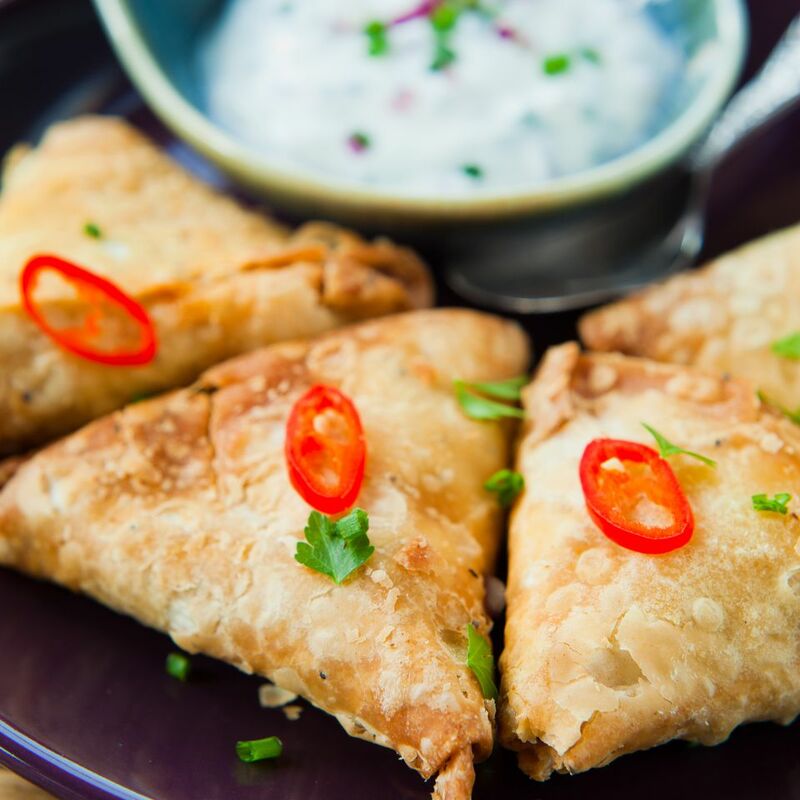 However, you prefer to eat your Indian samosas, be sure to serve them with a dipping sauce and enjoy your traditional Indian food meal! This baked samosa recipe is vegan as well as vegetarian, and lower in fat than traditionally fried samosas. In a large skillet over medium-high heat, saute the onions in a bit of oil until they are soft, about 6 to 8 minutes. Add the coriander, cumin, and cayenne, and cook for another minute. Remove from heat and add the potatoes, peas, and cilantro, stirring to mix well. Season with a bit of salt and pepper. Stack 3 or 4 sheets of phyllo together, and slice into 4 even rectangles with a pair of kitchen shears. Continue with the rest of the phyllo, then cover with plastic wrap. Place two or three tablespoons of the potato and peas mix in the corner of the dough, then roll the corner towards the center. Fold in the left and right corners, then roll up again. Place each samosa on a baking sheet, and lightly brush the tops with olive oil. *Note: You do NOT need to pre-cook the potatoes as long as they are chopped into small enough pieces.